Bondora is an Estonian based peer to peer lending platform that provides unsecured consumer loans. It was founded by Martin Rask, Mihkel Tasa and Partel Tomberg back in 2008 as isePankur and has grown to become one of the largest continental European platforms. Please note: I am not an active investor in Bondora – these are my ‘working notes’ to see if I want to invest. Loans are unsecured consumer loans to borrowers in Finland, Spain, Estonia and Slovakia. The target borrower is middle income, who is looking for something in between a standard bank loan and a short-term/payday loan. A consumer can borrow from €500 to €10,000 from 3 to 60 months. The average amount borrowed is €2,500 over 47 months, with reported average gross interest to the lender at 31.7%. Part 1: How are my EU investments treated for Tax? Are there differences to UK platforms? Are there additional statements required for tax returns? Part 2: What’s the cheapest and easiest way to deposit money into Euro based platforms from a British Pound bank account? Bondora is covered by the FSA, the equivalent of the FCA in Estonia. This should mean that UK investors are able to claim tax relief from defaulted loans against interest income. Other continental European platforms are not regulated by a relevant local financial regulatory body. Twino for example is not regulated as there is no specific regulatory body overseeing the P2P lending industry in Latvia. Bondora allows you to make deposits via TransferWise or SEPA bank transfer. TransferWise* is one of the cheapest money transfer services, they charge a flat 0.5% fee above the market exchange rate. There is a minimum charge of £2 per transfer, so if you transfer less than £400 in one transaction you’ll pay more than 0.5%. In a recent review of Twino, I found they needed the first transfer to by by bank account (a £23 charge for me as a Natwest customer). So it’s good to see that Bondora don’t have this hoop to jump through before you can make a low-cost money transfer. 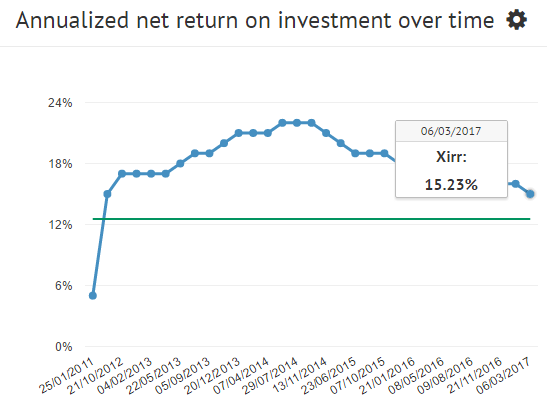 The green line in the chart is Bondora’s ‘portfolio expected return based on original balance’, which they calculate to be 12.55%. These numbers were taken on the 6th March 2017. My initial worry from looking at these numbers is that perhaps there is a delay in pricing in bad debt, so we start with higher gross returns that take a long time to reduce the long term average. I joined a group on Facebook called ‘Bondora Fellows’ where people share their experiences and returns. I don’t want to plagiarise anyone by copying their comments, but on the whole it was not very positive. Aside from poor performance on lending, some people claim that negative reviews on trust pilot have been flagged and removed. Some members also have problems with the way Bondora report losses and the over-expectation given to future income on bad debt. There’s a more detailed (and critical) investigation on the Bondora statistics here. There’s a large difference in returns by country, with Spanish loans the worst performing. Bondora claims to be the most licensed platform in Europe: authorised in the US by the SEC, in Estonia by the FSA, and in Finland by the RSAA. Note that they are not authorised by the UK’s FCA (Financial Conduct Authority), although I am not aware of any non-UK platforms that have gone through the extensive process. They run a 60-day money back guarantee where you can try them out for 60 days and if you are not satisfied you can request all of your money back. However, be aware that it may take longer than 60 days to fully realise the impact of bad debt on your portfolio returns. Anyone who is over age 18 and living in the EU, Switzerland or Norway, as well as businesses registered in the EU, can invest through Bondora. If you live or work outside the EU in any of the countries that comply with the EU’s anti-money laundering directive, you can invest through Bondora if you are an accredited investor. Bondora have ambitious goals to offer a wide variety of lending products, including mortgages. The CEO Partel Tomberg said in a interview last year that Bondora want to offer a wide range of financial products including mortgages. He compared it to Procter & Gamble, the consumer packaged goods company that offers a wide range of different consumer brands. Bondora hope to offer 10%+ returns across unsecured consumer loans in Spain, Slovakia, Estonia and Finland. In terms of low-cost money transfers from the get-go, and regulation by a local equivalent of the FCA, they are in a relatively good position for UK residents to join and invest. My only concern is that they may be inflating expectations of future returns by massaging the bad-debt figures. This concern is not based on my own experience or investigation, but from reading other experiences on the private Bondora members Facebook group (link above) and other articles. A * denotes a refer a friend or affiliate link. My Bondora refer a friend link is www.bondora.com/ref/BO362A7A1. If you sign up via this link you will have €5 free credit to make you first investment. I will also receive a small cash bonus for referring you. I’ve added this referral link as an after-thought and this review is written to be as objective as possible. You are an active investor in Bondora or have been in the last 6 months. Maybe you should ask people to post screen-shots of their investments as described on the Bondora web site. If they’re anything like mine, they say two opposite things. (2) You can take-out €1.50. The other €2,000 is yours; it is money, it is not written-off, but you cannot take it out and in all probability will never be able to take it out.